In the Top End they call this season “the dry”. It’s typically laconic, don’t-open-your-mouth-much-or-the-flies-will-get-in, Australian understatement. Like saying the Aboriginal people have “been here a while”. Our visit to Kakadu puts some perspective on both weather and longevity. Weather first. 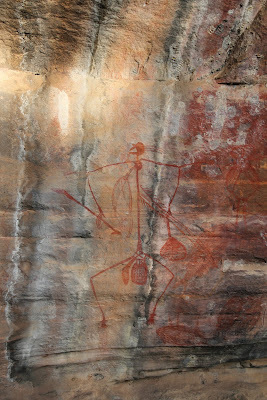 The Bininj/Mungguy people of Kakadu recognise six different seasons, and many subtle transitions between those. For them the “dry” – or that part of it between June and August – is called Wurrgeng. They see it as “cold weather time”, although we sleep with the air conditioning on! In the Aboriginal calendar, it's time to burn country. The flowering of a local eucalypt, the Darwin woolybutt (Eucalyptus miniata), is a signal to start burning the woodlands. This has the twim aims of bringing on green fodder for grazing animals, and keeping fuel loads low as protection against wild fire. When we are there fires trickle rather than rage, and many places combine a sooty dessication with vivid new greens. 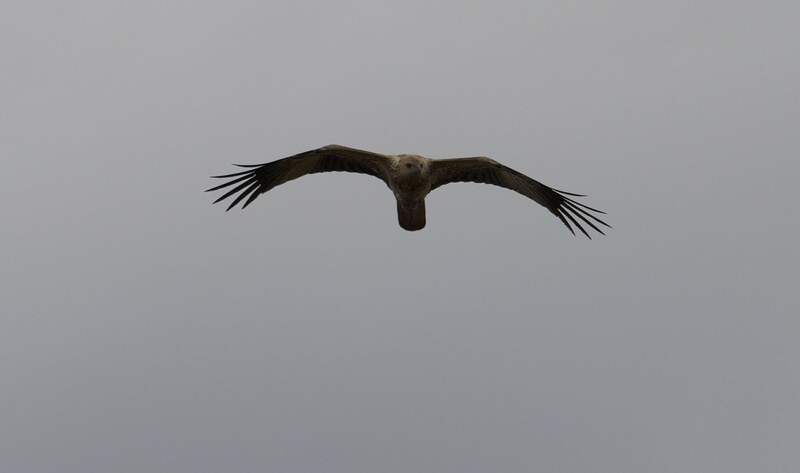 Burning practices are so ancient that birds and other animals have adapted. Remarkably the whistling kite (Haliastur sphenurus), a species found throughout Australia, has locally learned to spread fire by picking up and dropping burning branches. This increases its likelihood of successfully finding the prey species which either flee or perish in the flames. I daresay pre-cooked is just as good as fresh to a hunter and carrion eater. We discover other subtleties about the dry. Certainly it doesn’t rain – that much is straightforward. But neither is it all blue skies and relentless heat. In July most days begin clear, but as the day progresses clouds tend to wander across the sun’s face. They gather in a desultory fashion, like school children who have yet to do a serious day’s work but are headed in that general direction. When these trainee storm clouds gather, piling high enough to hint at darkness, it isn’t hard to imagine how things would change as temperature and humidity are lifted a notch. Those more serious clouds are part of Gunumeleng, known to many as the build-up. That will start in mid-October and culminate in Gudjewg, the monsoon season (December to March). While I love a good thunderstorm, I’ll be happy to spend that season back in the predictable uncertainty of temperate Tasmania. During “the wet”, the floodplains of Kakadu will fill, and all non-aquatic life will move to higher country. Ubirr, with its vast views over the East Alligator floodplain, gives us a good sense of that. It is a place with a powerful presence. 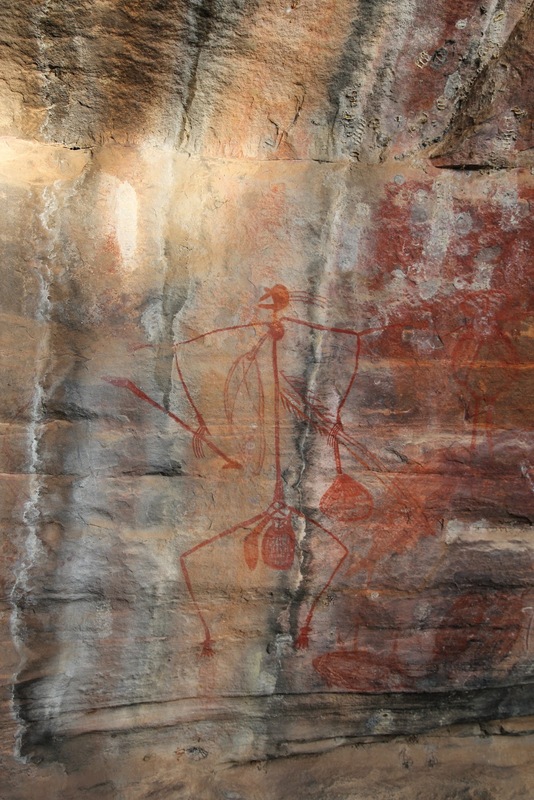 Rock walls, overhangs and cliffs hold more than a thousand generations of Aboriginal art. “More than a thousand generations” may sit easily on the page, but in the mind it can create temporal vertigo. As we wander past these galleries in near-silence, wonder after wonder is revealed. Here a brilliantly sylised depiction of a hunter; there a portrayal of some of his food sources. 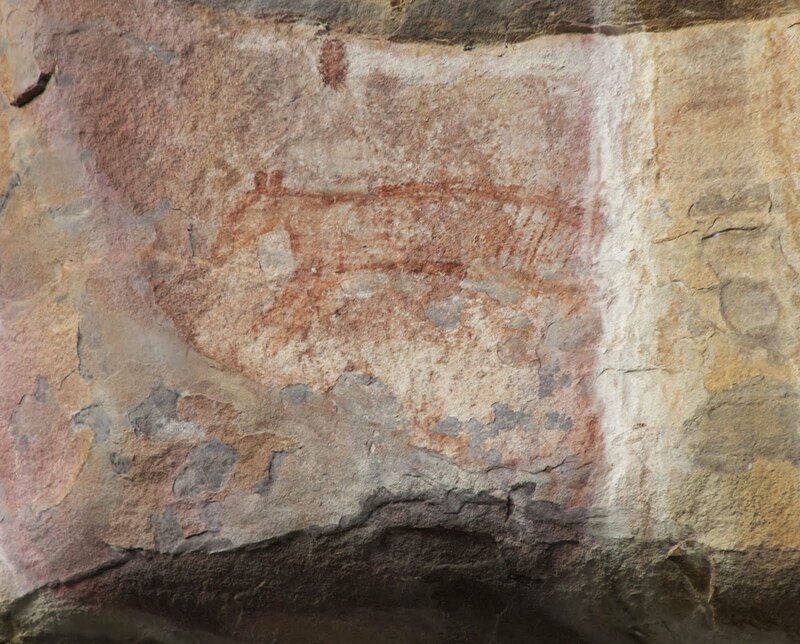 As a Tasmanian I am stunned to see a thylacine (Tasmanian tiger) outlined on a wall. The creature became extinct in the 1930s in Tasmania, but has not lived in Kakadu for thousands of years. Its depiction high on the main gallery of Ubirr gives me a dizzying sense of how long Aboriginal people have belonged to this country. 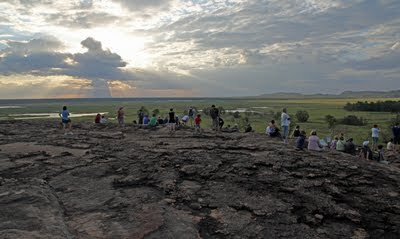 We end the day, along with many others, watching the sunset from the top of Ubirr. People wander about, chat in clusters, take photographs, or just sit and look. There is a quietness that borders on the reverential. 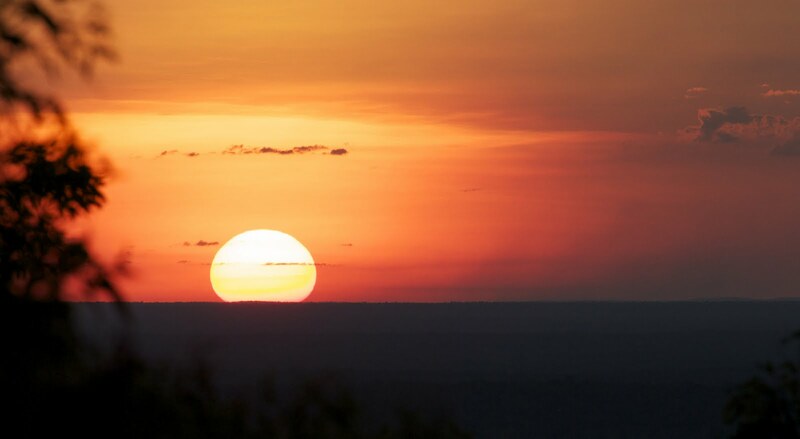 Although it's the dry, the setting sun gives away the presence of large amounts of water, as tell-tale reflections shimmer from the vast floodplain. Climate scientists fear that Kakadu, and the floodplain we’re looking out over, could be profoundly changed by climate change and sea level rise. That is as sad and sobering as the toxic presence of the invasive cane toad. But somehow there’s something hopeful in the fact that the Aboriginal people have lived here long enough to have seen enormous changes like this before. And they’re still here.